I made a prediction of sorts in CDC switches from nuclear war to flu as epidemic declared just before false alarm in Hawaii. Between this scare and the Trumps' "nuclear button" tweet, I can hardly wait to see how much closer to Midnight the doomsday clock gets moved later this month. Anyone else think it will be at least 30 seconds? Last week, the Bulletin of the Atomic Scientists advanced the clock 30 seconds to two minutes to midnight, just as I expected. 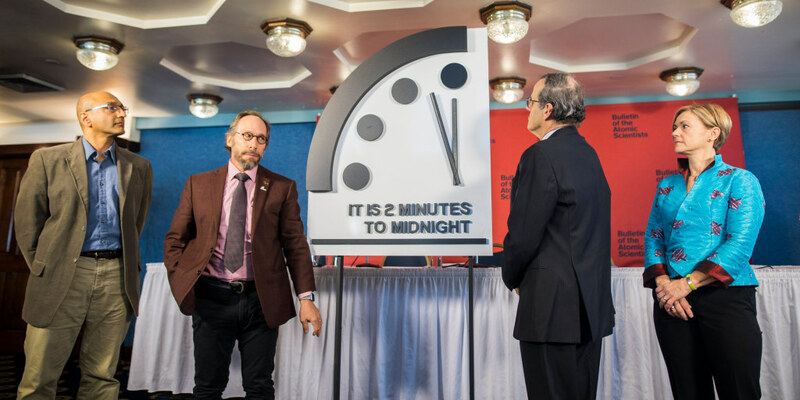 NBC News reports The Doomsday Clock Moves Closer To Midnight. The Doomsday Clock has been moved to 2 minutes to midnight in response to growing nuclear threats and climate change. The last time it was this close to midnight was in 1953 - a time when the U.S and the Soviet Union tested their first nuclear weapons. FiveThirtyEight also explained the rationale, writing "The group explained its latest move mainly by citing President Trump’s handling of nuclear risks in North Korea and Iran. It also throws in worries about climate change for good measure." It also traced the time of the Doomsday Clock in the graph below, showing that it is at the same time as it was in 1953 and also the closest it's ever been to midnight. That graph shows that the Doomsday Clock actually was at 11:58 P.M. all the way from 1953 to 1960, so I was born when the possibility of nuclear war was just as high as the risk of the end of civilization from nuclear war and climate change is now. That's not reassuring. What I do find reassuring is that things got better. This Crazy Eddie hopes that's the case this time, too, and that the biggest worry from the Doomsday Clock is fictional. While I'm done with January, I'm not done with DOOM! Stay tuned for a post about 2017 in climate change to start February at midnight. Tomorrow night and morning, three astronomical phenomena involving the Earth's Moon will happen simultaneously, a super moon, a blue moon, and a blood moon. 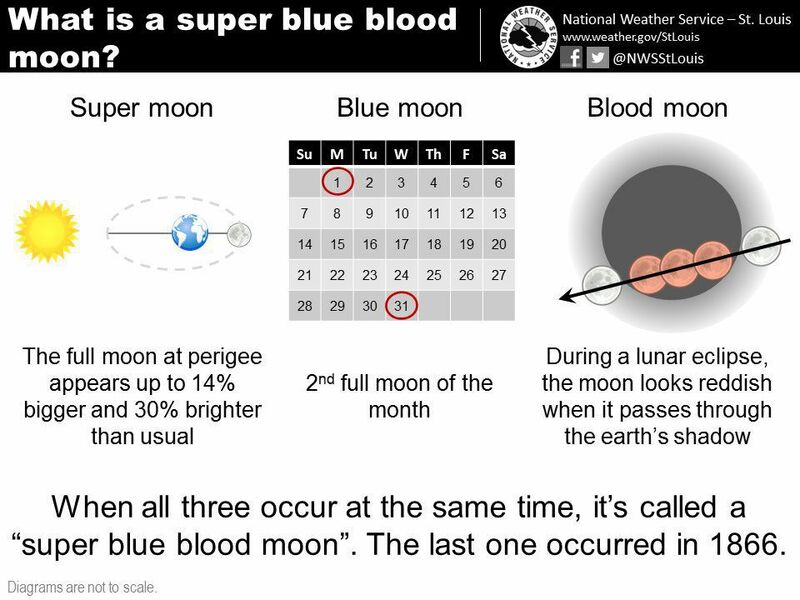 NASA describes all three in Jan. 31, 2018 Super Blue Blood Moon and Lunar Eclipse. This will be the last of a series of three supermoons as NASA explains in ScienceCasts: A Supermoon Trilogy. Happy viewing to those of my readers who can see the eclipse! Tonight is the Grammy Awards and I'll report tomorrow on the fate of the speculative fiction and science nominees. Stay tuned. That's what I promised my readers to end Speculative fiction sweeps movie categories at the Art Directors Guild Awards and that's what I'm delivering today. I begin with Gold Derby on the winners of music for visual media. “La La Land” wins Best Visual Media Compilation and Best Visual Media Score. Both awards go Justin Hurwitz, who also won two Oscars for his musical compositions. But Hurwitz, Pasek, and Paul were upset in the race for Best Visual Media Song: Lin-Manuel Miranda won for “How Far I’ll Go” from “Moana”; it’s the third Grammy of his career, and he just needs an Oscar to EGOT. I thought Hurwitz and "La La Land" would sweep, so I'm glad to be wrong about “How Far I’ll Go” from “Moana.” I shouldn't be surprised, as I observed a result like this was possible last December. I would say "La La Land" is the favorite, but the Emmy [Grammy] electorate is not the Oscar electorate and can vote differently. For example, John Williams lost at the Oscars but won the Grammy for "The Force Awakens." I didn't think the Grammy voters would go against the Oscar voters, but, once again, they did. Congratulations to Lin-Manuel Miranda and Auli'i Cravalho for their victory, the biggest one of the night for speculative fiction. Gold Derby also reported the other win for speculative fiction. Her IMDB awards page hasn't been updated yet, but when it is, this will be the most prestigious award she's ever won. It may not be the last award she'll win, however. I I fully expect Fisher to be nominated for Best Supporting Actress in a Film at the Saturn Awards, where I think she'll be favored to win. Speaking of Star Wars, John Williams received a Trustees Award and won Best Arrangement, Instrumental or A Cappella for "Escapades For Alto Saxophone And Orchestra From Catch Me If You Can." One of Fisher's fellow nominees for Best Spoken Word Album, Neil DeGrasse Tyson, was one of the presenters, as USA Today noted. "It's a tie!" Tyson announces for best recording package. He's not joking. A Grammy tie between El Orisha De La Rosa and Pure Comedy (Deuxe Edition). Only Grammy-nominated astrophysicist presenter Neil deGrasse Tyson could point out that not only are the Grammys turning 60, but so is NASA. He gives the Grammy for best instrumental composition to Arturo O'Farrill for Three Revolutions. Speaking of NASA, the next winner is one of theirs. 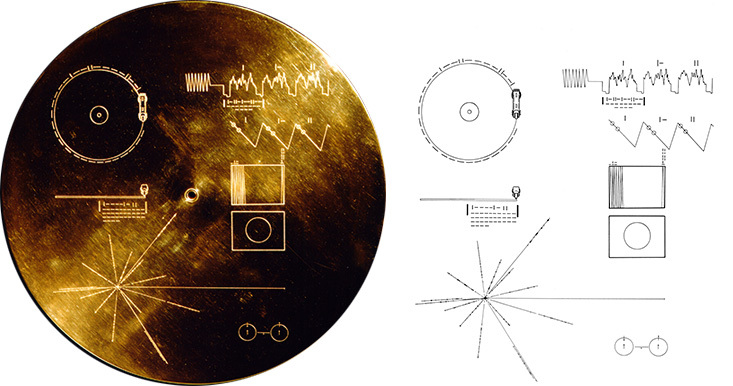 Yes, "The Voyager Golden Record: 40th Anniversary Edition" won Best Boxed Or Special Limited Edition Package. Score one for science! Finally, USA Today reported "HBO's The Defiant Ones, about the friendship between music legends Jimmy Iovine and Dr. Dre, wins best music film." That's the one I expected to win, even though I was rooting for "Long Strange Trip." By the way, I expect to blog about it again, as it will be eligible for this year's Emmy Awards. I close with “How Far I’ll Go” from “Moana,” which I included in Midweek Cafe and Lounge, Vol. 44 at Booman Tribune. 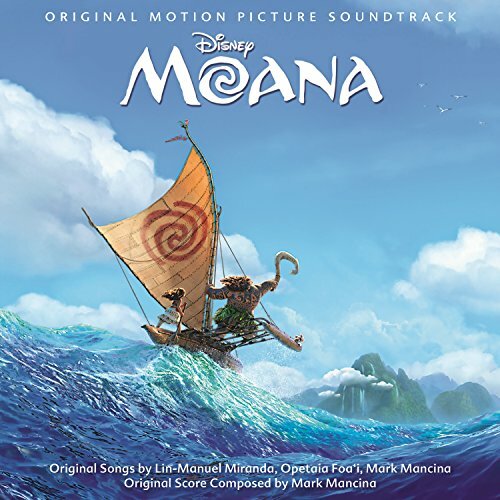 "Moana" was one of two feature films nominated by the Environmental Media Association as having an environmental theme worth recognizing, so I'm considering the Grammy nominated song How Far I'll Go to be from an environmental movie. Who am I to argue with the EMA? If nothing else, the CGI scenery is pretty. That's it for fantasy. Stay tuned for at least three days of reality. It was an outstanding night for speculative fiction at the Art Directors Guild Awards last night. Speculative fiction films swept all four movie categories and half of the six television catgories as well as capturing the short format category. That means science fiction, fantasy, and superhero movies, shows, and commercials won eight of the eleven awards. The most that genre films and shows could have won was nine. Deadline Hollywood has the names of the winners. In addition, Star Wars Battlefront II: “Rivalry / PS4” won for Short Format: Web Series, Music Video or Commercial. Even though "The Last Jedi" did not win, the Star Wars franchise still took home a trophy, two when one counts Kathleen Kennedy's Cinematic Imagery Award. Follow over the jump to see how my wishes and predictions fared. I did promise a post about the Oscar nominees today. Tomorrow. Stay tuned. That was my footnote to Happy Irish Coffee Day and Happy Birthday to Coffee Party USA!, which was the third time I promised. May the third time be a charm as I finally follow through. Here's Oscars 2018: Nominations Announcement. Tiffany Haddish and Andy Serkis announce this year's nominees. That was fun. I enjoyed both Haddish and Serkis announcing the nominees and the short segments introducing the technical categories. In particular, I appreciated the diverse selection of actresses featured. As for the nominees themselves, I think this is a very good showing for speculative fiction films. "The Shape of Water" earned thirteen nominations, "Blade Runner 2049" earned five, "Get Out" and "Star Wars: The Last Jedi" each earned four, "Beauty and the Beast" and "Coco" both earned two, and seven other feature films earned one each, eight if one counts "Loving Vincent" as speculative fiction simply because it's animated, for a total of 38 or 39 nominations. Add in the Animated Short Subjects and the total increases to 41 or 44 nominations for 20 to 23 films (I'm not sure about "Basketball Dreams" or "Negative Space" being speculative fiction simply because they're animated, just as I'm not convinced about "Loving Vincent."). That's about as many films as last year but half again as many nominations, as the 2017 ceremony had 20 films and 32 nominations for speculative fiction. It's even better than the 2016 Oscars, which had 15 speculative fiction films nominated with 36 nominations -- and I thought that was a good year for speculative fiction, especially science fiction! Finally, there are speculative fiction films nominated in every category for scripted feature length movies (including Foreign Language Films, as "Body and Soul" qualifies) except Makeup and Hairstyling and that only because this category has only three nominees. That's a lot of breadth in the excellence of speculative fiction films this year. I have more to say over the jump about the nominations and my opinions of the chances of the speculative fiction films in each category. I was planning on posting about the Oscar nominees today, but as I did in September with the death of Jerry Pournelle, it is my sad duty to report the death of another great science fiction writer, Ursula K. LeGuin. * I'll let Wochit News and Wochit Entertainment tell the story for me. First, Author Ursula K. Le Guin Has Died from Wochit News. Next, Fans Mourn Author Ursula K. Le Guin from Wochit Entertainment. Science Fiction and Fantasy author Ursula K. Le Guin passed away on Monday at the age of 88. First published in the 1960s, LeGuin's alternative worlds challenged readers' ideas on politics, gender roles, religion and sexuality. 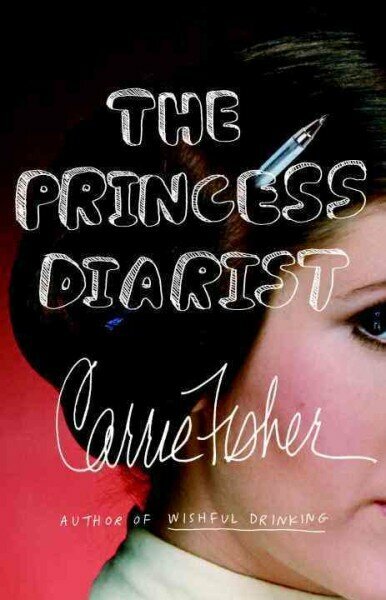 In 2016, The New York Times described her as "America's greatest living science fiction writer." LeGuin won the Hugo Award, Nebula Award, Locus Award, and World Fantasy Award, each more than once Her work has been adapted to the screen numerous times, including several versions of "The Lathe of Heaven" and and animated Studio Ghibli rendition of "Tales from Earthsea." Fans everywhere have taken to the world wide web, commemorating Le Guin and her profound impact on the world of fiction. I'm one of those fans. R.I.P. *I'll post about the Oscar nominees beginning tomorrow, beginning with the speculative fiction nominees. Stay tuned. 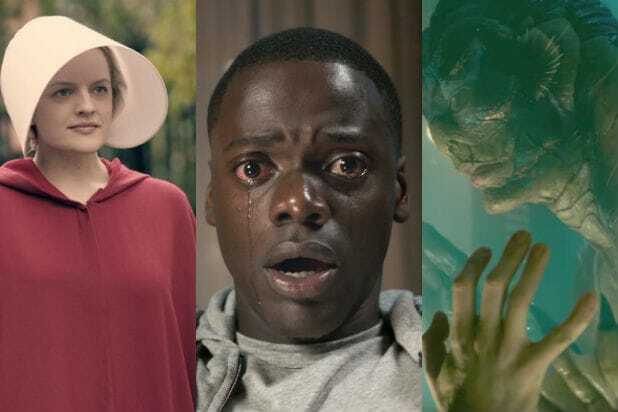 I was very optimistic about the prospects of the speculative fiction nominees at the 2018 SAG Awards and got more so as awards season progressed. Unfortunately, I was disappointed. I thought "Stranger Things" might repeat last years win for Ensemble in a Drama Series. Nope. Instead, speculative fiction only won two trophies for Outstanding Action Performance by a Stunt Ensemble for Motion Pictures and Television Series. Still, that's worth celebrating. Here is the announcement of the winners from the red carpet, beginning with Wonder Woman Wins Best Stunts: Red Carpet Interview from TNT. The presenters certainly showed their enthusiasm for "Wonder Woman" winning this award. I'm happy, too, although I can't claim calling it, as I merely wrote "Oh, look, two superhero films, a science fiction movie, and two action flicks, making this the strongest category for speculative fiction in movies." No prediction here. Next, TNT reported Game of Thrones Wins Stunt Ensemble: Red Carpet Interview. I did call this one. Follow over the jump to see how the rest of my predictions fared. At the end of 'The Shape of Water' and speculative fiction nominees galore at the BAFTA Awards, I wrote that I would blog about the speculative fiction winners at the PGA Awards today, so it's time for me to follow through. The good news is that every category with at least one speculative fiction nominee had a speculative fiction winner. Wochit Entertainment reports on the most prestigious category's winner in ‘The Shape of Water’ Wins Producers Guild Award. Guillermo del Toro's "The Shape of Water" has been named the best-produced film of 2017 by the Producers Guild of America, an honor that has typically been one of the most reliable indicators that a film is on track to win the Oscar for Best Picture. In the television categories, "The Handmaid's Tale" won for drama, "The Marvelous Mrs. Maisel" for comedy and "Black Mirror" for longform TV. Pixar's "Coco," to the surprise of no one, won the award for animated feature, while "Jane" won the documentary award. That description managed to summarize nearly all the categories I covered in 'Wonder Woman' joins 'The Shape of Water' and 'Get Out' among PGA film and TV nominees and then some. Follow over the jump to read how my wishes and predictions for these categories fared. 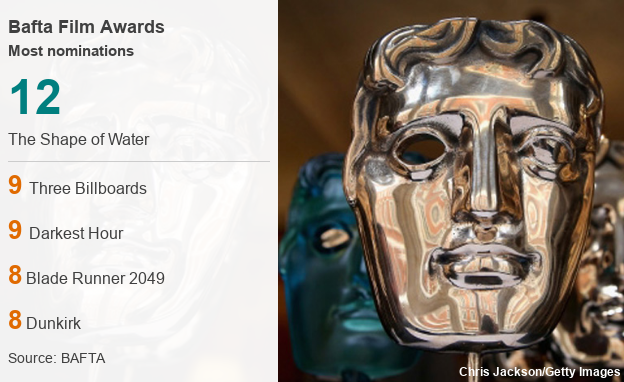 I told my readers to "stay tuned for more fantasy tomorrow as I write about the BAFTA nominees" at the end of yesterday's post about the Art Directors Guild Awards, but that's not happening today. * Instead, I'm sharing a day's worth of coverage from WXYZ on the meteor that exploded over southeast Michigan during the evening of the 16th. The coverage began with National Weather Service: Bright light, loud sound over SE Michigan was 'a likely meteor', which was from the 11 P.M. newscast on the 16th. The National Weather Service says the bright flash and loud noise that has been heard throughout southwest Michigan was "likely" a meteor, but they will continue to monitor feeds. That video went viral with 36,655 views and counting in 24 hours. By the next morning, the meteor was confirmed as WXYZ reported Meteor lights up metro Detroit. People across the area are still talking about the meteor that lit up the night sky over Michigan. I'm with Sima Chowdhry; I missed it entirely, while friends of mine at work and on Facebook caught it. I didn't even find out until the next morning when I was asked if my students could use articles about the meteor for extra credit (of course the answer was yes). Darn. Chowdhry mentioned people hunting for meteorites. That was the main topic of Hunting for meteorites on Michigan soil. The day after a meteor lit up the sky over Michigan, people were out looking for chunks of it as scientists explain exactly what happened. It's amazing what the possibility of striking it rich will inspire people to do. The hunt continued in Head of astronomy at Cranbrook says meteor debris may have landed near Mount Clemens. Metro Detroit is waking up this morning after last night's meteor madness, wondering what exactly happened. I hope the people actually found a meteorite. As for the story, it's one I can tell for years whenever the subjects of meteors, meteorites, and asteroid stikes come up. *I still plan on posting that entry tomorrow. Stay tuned. A happy and contemplative Martin Luther King Day to my readers! To celebrate, I'm continuing the tradition I began with 'Glory' from 'Selma' for MLK Day and continued with Hollywood's diversity issues for MLK Day and 'Hidden Figures' tops the box office for MLK Day plus diversity among Golden Globes winners, examining diversity and representation in entertainment, which I wrote I would do yesterday. I already looked at diversity among winners at the Golden Globes winners, so I today I'll feature diversity among music nominees at the Golden Globe Awards and winners of the Critics' Choice Awards. Two nominees for Best Song, one at both the Grammy Awards and Critics' Choice Awards and another at the Golden Globes, begin today's celebration. The one in the preview image is "Stand Up For Something" by Andra Day feat. Common. Written by Diane Warren and Lonnie Lynn, from the original soundtrack to the motion picture "Marshall", in theaters Oct. 13, 2017. While I'm still confident this song will be nominated for an Oscar and is still my favorite to win the Grammy, I am less confident it will win an Academy Award. I expect "Remember Me" from "Coco" will instead. The next song for today is Mary J Blige - "Mighty River" (Mudbound OST). Blige not only wrote and performed the song, but also starred in the film. I would be pleasantly surprised if it were nominated for an Oscar, although doing so would likely push out either or both of "Truth to Power" from "An Inconvenient Sequel" and "Tell Me How Long" from "Chasing Coral." Well, I can't have everything. On the other hand, this song is eligible for a Creative Arts Emmy Award and should be nominated this summer. Follow over the jump for diverse winners from the Critics' Choice Awards. 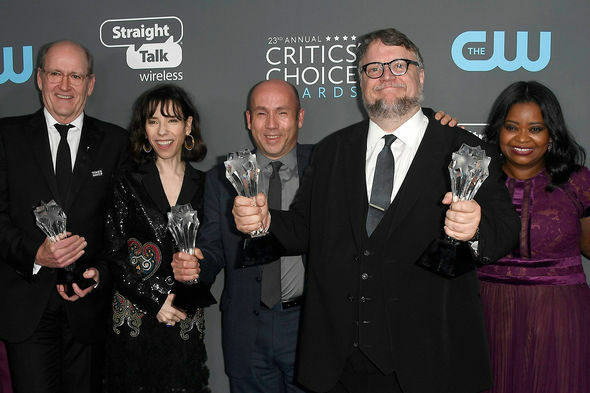 To conclude 'The Shape of Water' leads speculative fiction winners at the Critics' Choice Movie Awards, I told my readers "I'm not done with the Critics' Choice Awards. Stay tuned for the television winners as the Sunday Entertainment feature." Read along as I follow through by checking the predictions I made in Speculative fiction and science at the 2018 Critics' Choice Television Awards, just as I did yesterday with the movie nominees, comparing them to the winners. I begin with the three categories in which "The Handmaid's Tale" earned nominations. This field looks like the one for the comparable award from this year's Emmys with "Westworld" replaced by "Game of Thrones" and "American Gods" filling in for both "Better Call Saul" and "House of Cards." I'm particularly glad to see "American Gods" recognized for headline awards instead of just technical ones like Main Title Design and Special Visual Effects in a Supporting Role. That written, I don't think it will win this category. Nor will the show I'm rooting for, "Stranger Things 2." Instead, I suspect that a lot of the voters overlap with those for the Television Critics Association Awards, where "The Handmaid's Tale" won the equivalent category plus Program of the Year. Added to the five awards "The Handmaid's Tale" won on the last night of the Emmys, where it won the equivalent award as well, and I'd say that the Hulu adaptation of Margaret Atwood's dystopian classic is the favorite to win this category. I was absolutely right, it did. 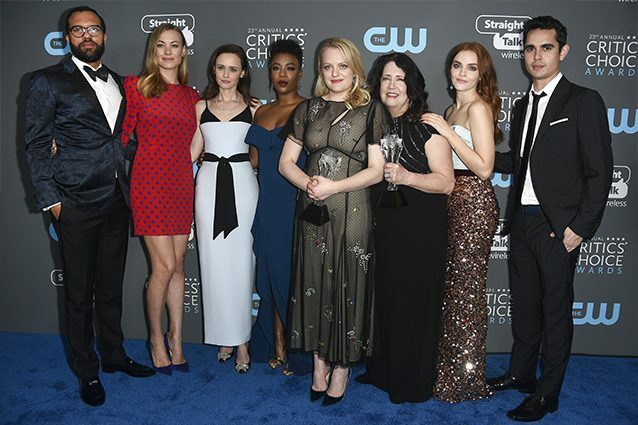 Watch The Handmaid's Tale Wins Best Drama Critics Choice Awards 2018. I called the next one as well. Half of nominees represent speculative fiction series, Caitriona Balfe for "Outlander," Tatiana Maslany in "Orphan Black," and Elisabeth Moss in "The Handmaid's Tale." If this were up to a vote of the viewers, Balfe would win. It's not. I think it's between the past two Emmy winners for Outstanding Actress in a Drama Series, Maslany, who won last year and Moss, who won this year. I might have more to say about Christine Baranski, Claire Foy, and Robin Wright, who are all starring in political dramas, in a future entry about political shows nominated for awards. If pushed, I'd have said Moss would have been favored over Maslany and I'd have been right. Here's Norman Reedus (Woo, hoo! Daryl Dixon!) announcing as Elisabeth Moss Wins Critics Choice Awards 2018. I'm glad to see and hear her thanking everyone in the collaborative enterprise that is shooting a television program. Everyone is needed and they are all important. I have one last category for "The Handmaid's Tale." Gillian Anderson is the actress playing one of the "new gods" I mentioned earlier. She plays Media in "American Gods." Joining her in representing speculative fiction shows is Emilia Clarke and Ann Dowd. Dowd won the Emmy, so I would say she is the favorite, although Margo Martindale is a perennial winner of the guest actress Emmy Award, so she might be able to pull off an upset in a supporting role. As I expected, Dowd won again. Apparently, she didn't expect it, given the excellence of the actresses against whom she was competing. Watch her reaction in Ann Dowd Wins Supporting Actress Critics Choice Awards 2018. With that, "The Handmaid's Tale" swept all of the categories in which it was nominated, reminiscent of the last night of the Emmys. Last week, President Trump engaged North Korean leader Kim Jun Un in a war of words on Twitter. Kim gave a speech in which he warned a "nuclear button is always on my desk." Trump returned fire by tweeting "North Korean Leader Kim Jong Un just stated that the “Nuclear Button is on his desk at all times.” Will someone from his depleted and food starved regime please inform him that I too have a Nuclear Button, but it is a much bigger & more powerful one than his, and my Button works!" That prompted a variety of responses, both serious and silly. There's no physical button, but there is a "football" and "biscuit". Just a week into 2018, Donald Trump tweeted a provocative message directed at the North Korean regime's leader, Kim Jong Un. His message cited a "nuclear button", and claimed that his was much larger than Kim's. But how does the U.S. protocol for launching nuclear warheads actually work? It's a process that's designed to be fast - there are only a few steps. But it's still more complicated than a simple button. The article accompanying the video concluded with the same chilling quote that the video did. It could take as little as five minutes for intercontinental ballistic missiles to launch from the time the president officially orders a strike. Missiles launched from submarines take about 15 minutes. “The president can order a nuclear strike in about the time it takes to write a tweet,” [Joe] Cirincione said. Eep! That makes it sound easy enough that Trump could actually do it. At the other extreme, KFC UK and Ireland had one of the better silly responses. That went viral, earning 498,424 likes, 189,332 retweets, and 4,190 replies. One of those replies was mine, in which I told KFC to pick on someone their own size, at least on Twitter: "Too bad @Wendys doesn't have UK locations. I'd dare you to get into a Twitter fight with them." That tweet earned 427 likes, 10 retweets, and ten replies. It was the most popular tweet I've ever posted and got more engagement than any of the tweets The Independent or Atlanta Constitution quoted. As for McDonald's, the company never responded on Twitter. Happy National Cut Your Energy Costs Day and Save the Eagles Day! These are the two national days I promised to celebrate at the end of both 'Wonder Woman' joins 'The Shape of Water' and 'Get Out' among PGA film and TV nominees and 'The Shape of Water' and 'Coco' -- fantasy and diversity both winners at the Golden Globes. Instead of celebrating energy conservation, I'm celebrating something that will reduce the cost of energy. Newsy reports Commission Shuts Down Rick Perry's Proposal To Prop Up Coal, Nuclear. The Federal Energy Regulation Commission rejected Perry's proposal to subsidize coal and nuclear plants. Yes, that was a dumb idea that was going to add carbon dioxide, soot, mercury, and radiation to the atmosphere and cost Americans more money, too. 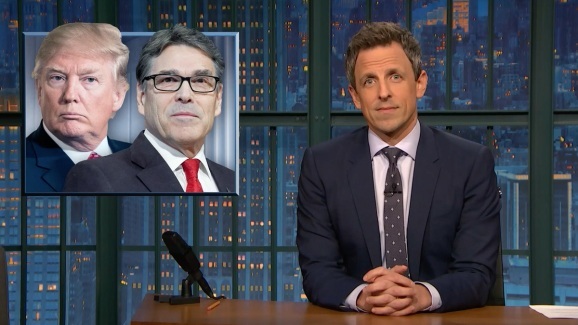 It was such a dumb idea that Seth Meyers made fun of it and Perry in The Check In: Rick Perry and the Department of Energy. Seth checks in on Rick Perry, the man President Trump chose to lead the Department of Energy, an agency that Perry once wanted to abolish. The last time I posted Seth Meyers making fun of Perry, I told my readers to expect Aggie jokes whenever I blogged about him again. I think the clips Meyers used satisfy that promise. Meyers mentioned Bob Murray and Murray Energy, which reminded me that I mused about "following up on Last Week Tonight with John Oliver's 'Coal,'" which won Television Episodic Comedy at the 2017 Environmental Media Association Awards for film and television. Murray and his company play a major role in that segment, so I think now is the opportune time to post it. Follow over the jump. I wrote "I'll have more on the speculative fiction winners in movies tomorrow. Stay tuned" to conclude Oprah, 'Big Little Lies,' and 'The Handmaid's Tale' win and say #TimesUp at the Golden Globes. It's time to follow up on that promise about the Golden Globes movie nominees. While "The Shape of Water" was the most nominated film with seven nominations, it won only two awards, Best Director and Best Original Score, falling behind "Three Billboards Outside Ebbing, Missouri," which earned four statuettes and tying "Lady Bird." 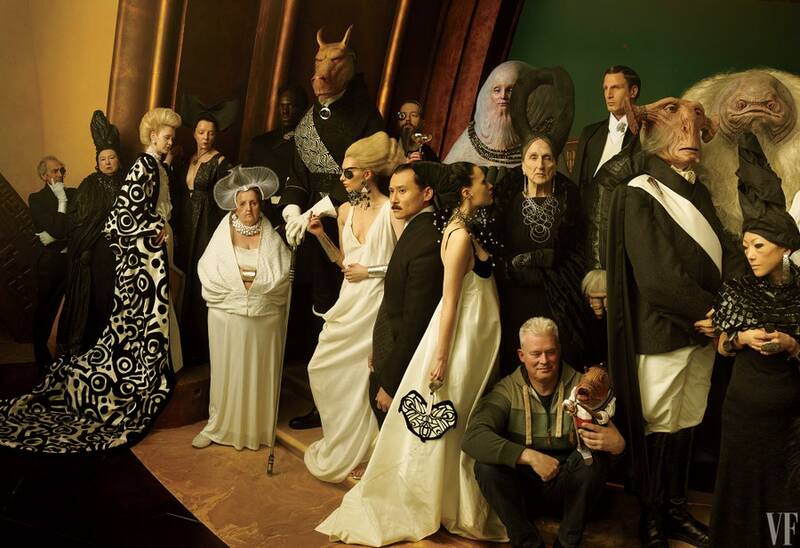 That written, it was the most recognized speculative fiction film as well as a victory for diversity. Watch Guillermo del Toro Wins Best Director at the 2018 Golden Globes. Guillermo del Toro accepts the award for Best Director at the 75th Annual Golden Globe Awards. I called Del Toro one of the big name directors along with Christopher Nolan and Steven Spielberg. I also wrote "'I'm rooting for Nolan,' but I'm not optimistic." I was right to not be optimistic. I should also root for Del Toro. As for the next category, I wrote "I still think Zimmer will pull this one off for 'Dunkirk,' but I'm beginning to worry about Alexandre Desplat and especially John Williams winning instead." Again, I was right to worry. Watch The Shape of Water Wins Best Original Score at the 2018 Golden Globes. Composer Alexandre Desplat accepts the award for Best Original Score at the 75th Annual Golden Globe Awards. Now I'm going to have to listen to the soundtrack. The one category that was almost guaranteed to produce a speculative fiction winner was Best Motion Picture — Animated, which I thought would go to either "Coco" or "The Breadwinner" with "Coco" having the edge based on what I wrote in 'The Shape of Water' leads speculative fiction at the 2018 Critics' Choice Movie Awards. I was not disappointed, as Coco Wins Best Animated Motion Picture at the 2018 Golden Globes. Writer and director Lee Unkrich accepts the award for Best Motion Picture - Animated at the 75th Annual Golden Globe Awards. I've written about my visit to Oaxaca and its observation of the Day of the Dead, so I would enjoy this movie. I would also enjoy its songs, including the one I expect to be nominated for an Oscar, "Remember Me." I'll be listening to them right after I finish the soundtrack to "The Shape of Water." Follow over the jump for other winners for diversity and speculative fiction at the Golden Globes. Facts and fancy about feisty lemmings for the first Norther of 2017! Happy Norther! What is Norther? It's a fake holiday created by John Michael Greer the Archdruid in response to my telling him about Wester and its animal mascot, the Wester Squirrel. Druids would likely demand a Souther and a Norther, too, with a Souther Wombat and a Norther Lemming as animal mascots; I'll leave you to decide what if anything they do with goodies. Ah, but which solstice gets which holiday? At first, I was not amused by your suggestion, as I thought one parody holiday was enough. Then I slept on it and not only was I OK with it, I decided that Norther would come after the Winter Solstice and Souther would come after the Summer Solstice. Why would a lemming visit in the middle of summer? As a result of that conversation, Norther takes place on the first Sunday after the first full moon after the Winter Solstice, which is today. Enough of the salutations -- time for the celebration. In lieu of the Norther Lemming dropping off presents into the ocean, I'm taking a cue from Silly Squirrels for Happy Wester 2017! Here are three videos showing lemmings being entertaining, although 3 Facts About Lemmings from SciShow does more telling than showing. 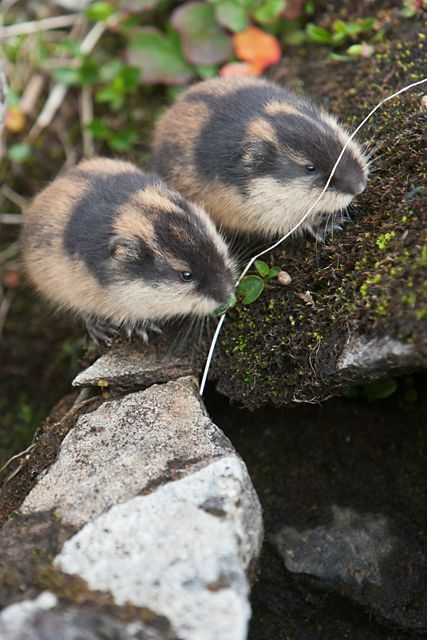 Lemmings are small, thickset vole-like animals that live in the Arctic tundra. They live in a harsh environment, are super-cute, kinda mean, and totally misunderstood. But here at SciShow we're going to set the record straight with 3 Actual Facts About Lemmings. SciShow didn't explain how lemmings are "kinda mean," but Fearless attack lemming - World's Weirdest Events: Episode 2 - BBC Two does. The humble lemming isn't exactly known for its ferocity. Yet this particular rodent will try to fend off all predators. Chris Packham takes a closer look at this very unusual creature. Wow! That's one fierce little animal! Perhaps that's why lemmings took on the roles of warriors in Norm of the North. This is still Sunday, so count this clip as the entertainment feature for today. Yes, Entertainment Sunday still exists, even though I'm doing much more searching for a good fantasy than dealing with reality these days. Also, I called today "the first Norther of 2017." Why? The next Norther will be January 7, as the full moon falls on New Year's Day, so there will be a Blue Moon on January 31. Speaking of blue lunar holidays, the first full moon after the 2018 winter solstice will fall on Saturday December 22nd, so there will be a second Norther on December 23. Blue Norther on Festivus! That's why. I get to do this all over again in 11 months. Maybe I can find a video about a lemming feat of strength or airing of grievances by then. As I wrote in yesterday's entry about the WGA film nominees, ""The Shape of Water" and "Get Out" have been nominated in every major awards show so far, the 2018 Critics' Choice Movie Awards, AFI Awards, Golden Globe Awards, and SAG Awards." Therefore, it should come as no surprise that both were nominated in the Producers Guild of America (PGA) Awards for The Darryl F. Zanuck Award for Outstanding Producer of Theatrical Motion Pictures, the PGA equivalent of Best Film. The surprise comes from which speculative fiction movie earns the third spot that all awards shows so far have given to either science fiction or superheroes. At the Critics Choice Awards, that distinction went to "Blade Runner 2049." The AFI Awards bestowed the honor to "Wonder Woman." Both the Golden Globes and SAG Awards recognized "Downsizing" for Hong Chau's performance, as did the Critics Choice Awards. The WGA Awards made "Logan" the third nominee for Adapted Screenplay. The PGA Awards followed suit, giving "Wonder Woman" one of the eleven nominations (there was a tie for tenth), making it the third speculative fiction film to be recognized in the most prestigious motion picture category at these awards. Here is the entire field from Deadline Hollywood. Toss out one of the nominees and that could be the Oscar field for Best Picture. As for which one that might be, I'd pick either "I, Tonya" or "Molly's Game" if "Wonder Woman" is to make the cut. By the way, "Get Out" is already a winner, as Deadline reported ‘Get Out’ To Receive Producers Guild’s Stanley Kramer Award. Congratulations! I can't think of a better film for this honor. Any show that has an award for animated features automatically recognizes speculative fiction. Here are the nominees from the PGA. The four highest grossing animated movies of last year, which I listed in Celebrate National Science Fiction Day with 'The Last Jedi' atop the 2017 box office, are all nominated, "Despicable Me 3," "Coco," "The LEGO Batman Movie," and "The Boss Baby." Based on box office, "Ferdinand" might come as a bit of a surprise, as it just passed "The Lego Ninjago Movie" but is still behind "Cars 3," "The Emoji Movie," and "Captain Underpants: The First Epic Movie." I wouldn't have expected any of them to be nominated. In fact, I wouldn't be surprised if "The Emoji Movie" earns a Razzie or two. Instead, I thought one of "Loving Vincent" or "The Breadwinner" might earn the fifth spot. Nope, the story of the gentle bull gets it. Enough with movies. Follow over the jump for the three television categories with speculative fiction nominees.